Use the doubled recipe for Pie Crust before you start prepping your apples to get your crust chilling. Peel (or not) & core the apples. Mix in a bunch of cinnamon & a bit of nutmeg, clove, or whatever spices you adore with your apples. Blend in a tablespoon or so of tapioca flour (or plain flour) to add thickness. Add sugar if you wish (I rarely do, or just a very little -- I like to add mine in the form of ice cream for that tart-sweet, hot-cold goodness). I like to let the mixture sit at room temperature for twenty minutes or so (while I roll out my crust), stirring occasionally. Pile the apple filling into your crust. Pile it high -- it will bake down. Top it with a second crust into which you have poked some holes or cut some cute designs. I never bother with a woven crust because it's such a pain to cut, but I have been known to cut out crust stars & make a hole-y crust that way. Bake at 350°F until you see the bubbles coming up through your holes (an hour or so). If your pie is piled high it will be juicy -- I put a baking tray underneath in case it bubbles over a bit. 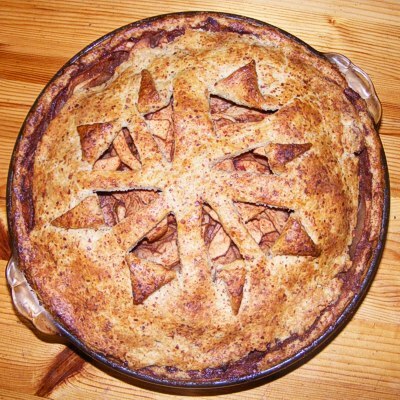 I check my apple pie at 45 minutes, then start keeping a closer watch on it. If the crust is browning but the filling is not bubbling, cover it loosely with tin foil -- edges too! When the filling has sunk down & is bubbling away all through, your pie is done. If your crust isn't quite brown, you might raise the temperature & leave it in for another 5 minutes. Allow to cool some, then cut & serve with ice cream. You can see that my top crust does not reach the edges (no need). To make openings for the steam, I just sliced & folded back the crust in a star-like design.